I had to get away from the computer for awhile. I was tired, but feeling the need to make something. 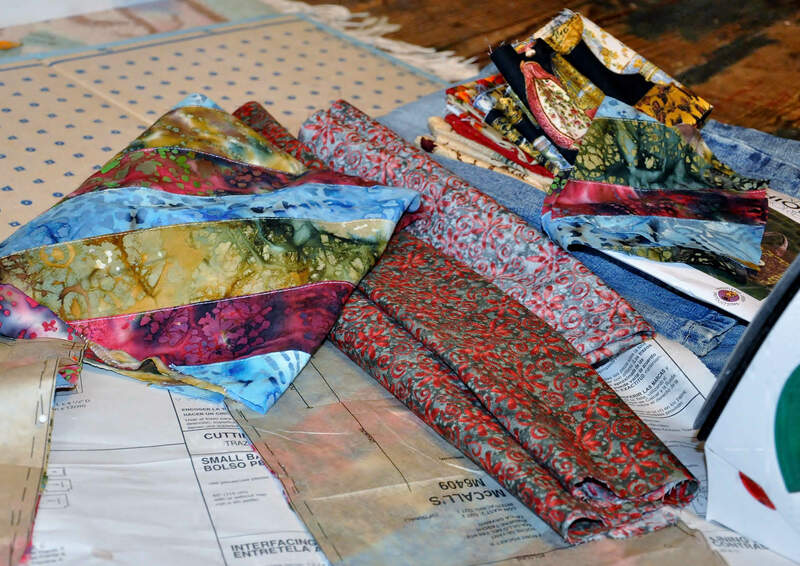 For a long time I have been thinking about making a bag, a tote, or a purse of some sort. I have this struggle with purses, they are either too big or too small, too many pockets or too few, never the right color with the right style, too expensive or just unappealing. I’ve been dreaming of the perfect handbag for a long time. Does it exist? So I decided to make a bag with a pattern I’d bought in the past, and fabric I’ve collected over the years. Hmmm…. here were some of my choices. Actually, the red flowers with grey background I didn’t find until later, that was the problem I ran into, not finding a compatible lining & contrasting material. I’m not good at following directions, not because I can’t read them, it’s just that there’s random alternate ideas running through my head. 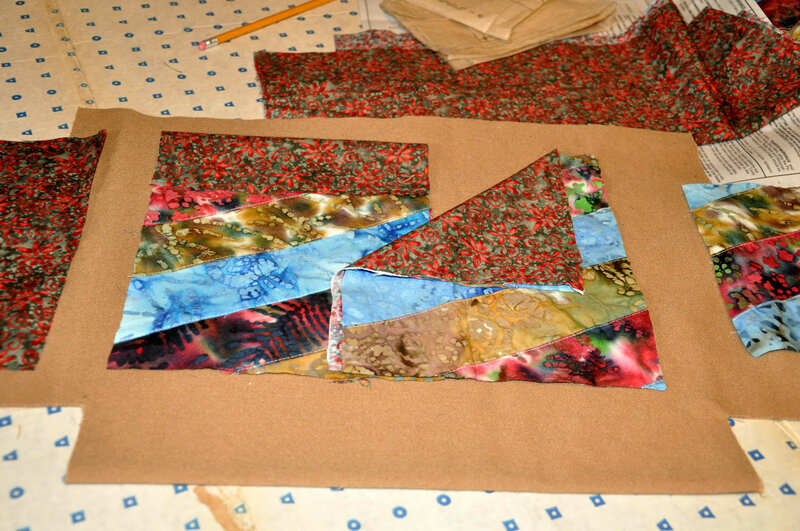 This pattern called for fusible fleece between the lining & the outer material. I didn’t have any so I thought I would use a heavy material like denim instead. The only denim I could find was too worn and the pieces wouldn’t be big enough. I was determined to make a bag though, no matter what. I just wanted to complete a sewing project. As I looked around the room (my daughter’s bedroom which doubles as our craft room) I noticed something at the bottom of the stairs. “What is that nice, dark tan, heavy-looking material?”, I thought, “I didn’t know I had material like that.” When I picked it up I realized it was the top flap I had cut off of an old canvas sleeping bag. The sleeping bag my son won’t part with because it’s so comfy. Anyway, I had washed it and put it on the stairs to the attic (aka: craft room) and forgotten about it. It was soft & strong. The color was perfect I thought, but that’s when I had the problem finding a lining material that would tie things together. So I started going through all my material and decided to go in a different direction, with autumn colors. Easy for now, i can make something more challenging later. Of course I have to do things the hard way, changing ideas as I go. I decided to make upper & lower pockets instead of having all the pockets at the bottom. My lining is a little too floppy because of not using the fusible stuff. 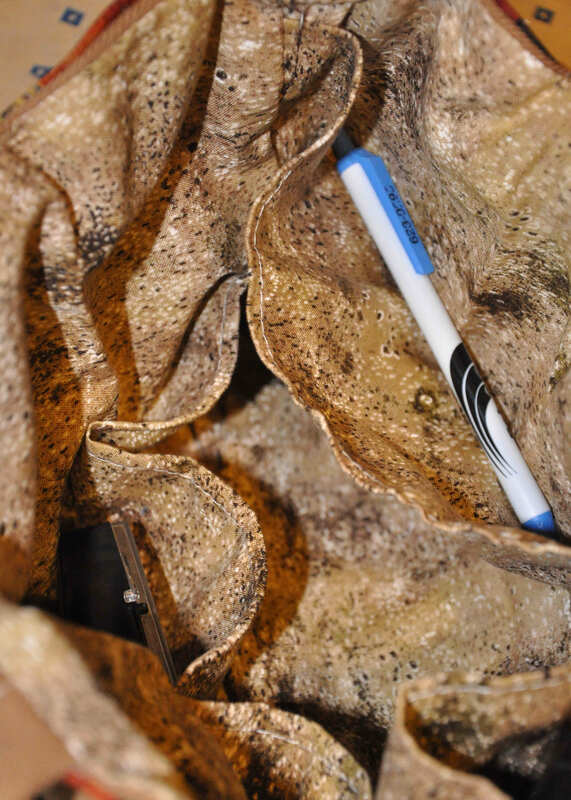 I like having a light color inside the purse though, so you can see when you look in. This kind of looks like entering a cave. It was kind of an experiment by this time. I really wasn’t being too picky or careful about anything because I just wanted to do it. I have not done much sewing for a long time because it causes pain in my neck & shoulder. I did this project on and off for 3 days to deal with the pain. When I finished it I felt it still needed something. I showed my husband and he said it needed some trim at the top. He was absolutely right. Ideally it would have been better to do that earlier in the process, but I made it work anyway. 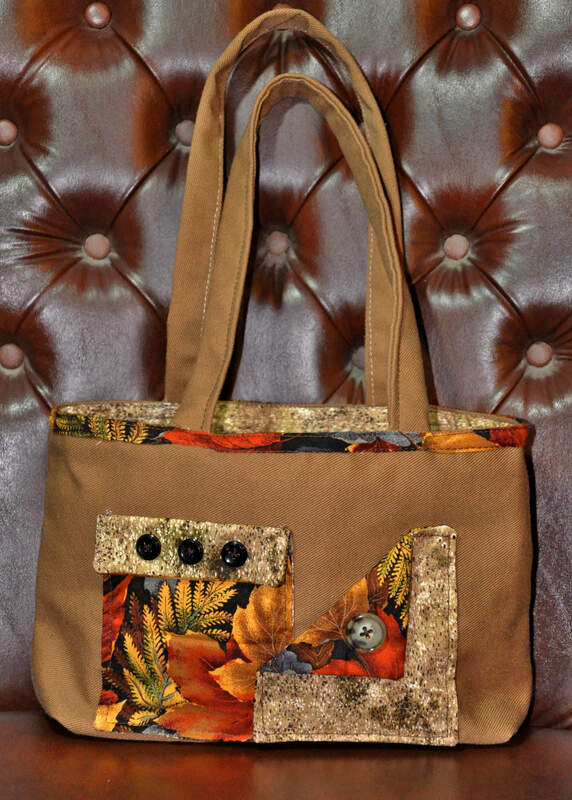 As I went through this process I realized this would not be the perfect bag because it is really just a tote. 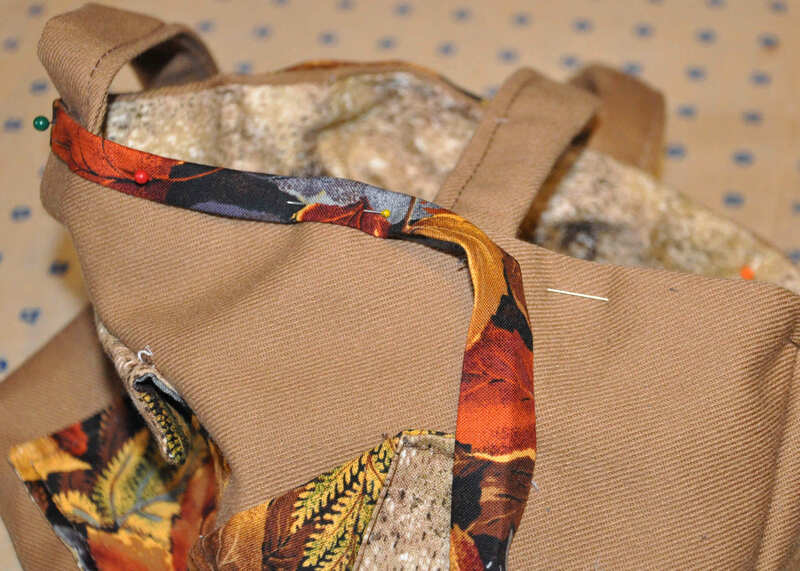 A tote is good at times, but sometimes you want a zipper or flap so the top is not open for anyone to reach into. This is supposed to have a snap at the top in the middle, but I’m not sure how I feel about that. It was a good learning experience anyway, and I think it’s really cute. What do you think? Would you buy a bag like this? This is a small tote. It gave me ideas for a bigger tote, one that could carry a small laptop or a drawing pad or knitting stuff. I think I wont put pockets inside the bigger one, but maybe I’ll put pockets on the back. I’m sure I won’t follow the pattern exactly, so maybe I’ll even change the straps and make a flap. I like the soft canvass and I like coordinating materials, so here we go again, I’ve already started cutting fabric for the next one. Eventually one day I’ll design the perfect bag, maybe. I don’t like changing bags all the time, but I wonder if it’s possible even, to make one handbag that is fun & funky but versatile enough to use almost all the time? What do you think? Looks fun and practical to me Cheryl!! First off, I would totally buy it–rock on! Second off, the old me would’ve said it’s absolutely possible to have one bag versatile enough to do it all, but this me tends to alternate between a smaller daily purse and two larger bags. One of the larger bags serves as my purse/diaper bag when I’m traveling with Li’l D; it fits so much more than his actual diaper bag. The other large bag is the one I use when I’m carrying my laptop around locally. It used to be my messenger bag of perpetual use, but I realized it was actually hurting my back to wear for long stretches. Thanks for the positive feed back. When I had little ones I always just threw my wallet & hairbrush onto the diaper bag. I had a really awesome diaper bag though.